It’s Friday . . . I have made it through the first week back after Easter – phew! It’s been a busy week with my Crest students being assessed and preparing my upper 6th for their AQA CHEM6X EMPA paper. 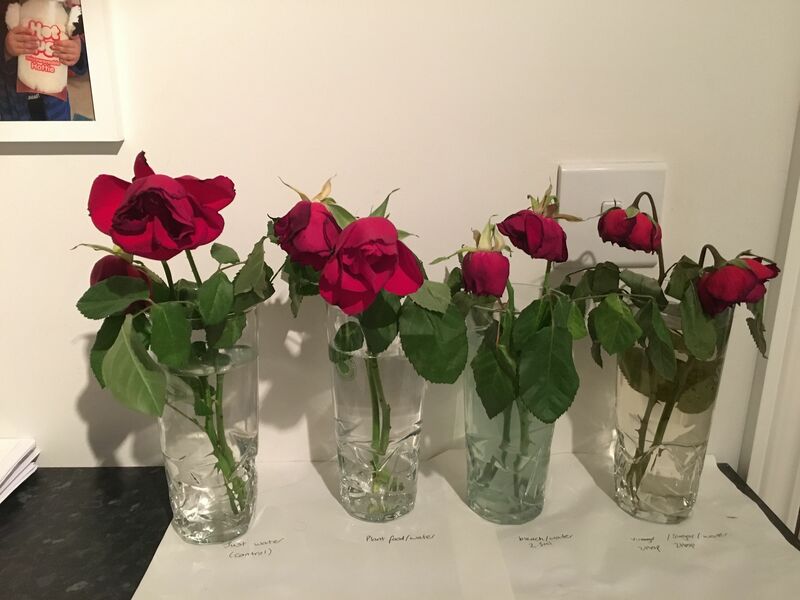 As I opened the kitchen to dump my school bag, I was greeted with a beautiful bunch of roses from my partner. .. and I had an idea! Only that day, I had been discussing with my upper 6th last year’s CHEM6X which focused on flower food. I had also got the results of my Crest assessment where students had been researching areas of science and technology which interested them. 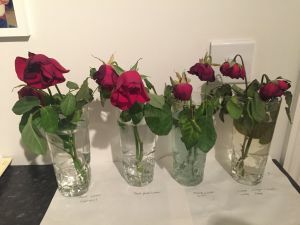 So, I mused, does flower food really increase the life of the cut roses? I know that my Grandma swears by vinegar and sugar in the water, my mother prefers a drop of bleach and to be a good scientist I’d need a control, so tap water would need to be investigated. 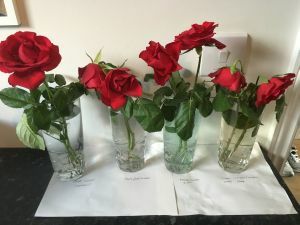 Before I knew it, my two primary age children and I were setting up a kitchen experiment to look at the merits of each type of liquid to improve the life of the flowers. Crest is a qualification offered by the British Science Association which aims to encourage 11 to 19 year olds to explore real-world science, technology, engineering and mathematics in an exciting way. My sixteen Crest Clubbers have looked into a diverse range of science this year including which is the best hair straightening product, how pigeon’s behaviour relates to dog’s behaviour and what makes the best yeast to make beer. Crest offer a Discovery level, which is the introductory level and takes about five hours. Bronze is aimed at KS3 and is about 10 hours work, Silver is about 30 hours and aimed at KS4 and Gold is aimed at 6th form and is about 70 hours of project work. Students do not have to do them in order, and they can be entered for one level but actually reaches a higher qualification if their project merits it. As I was preparing for the Crest assessment, it struck me how fresh faced their enthusiasm for science and investigation was and how diverse their investigations were. And I couldn’t resist my own mini kitchen-based project!